Why do we think developers are special? I teach a Guardian Masterclass as part of their “Digital Journalism Bootcamp” course. Specifically, my part of the month-long class is a 90 minute workshop aimed at journalists, outlining how developers work, what they do, and how they use process to organise work (there’s an Agile taster session). There are also some more general tips on how to get on with a type of person who’s traditionally seen as a bit grumpy, difficult to communicate with, or even hostile. I was beginning to say something about the situation where a developer is juggling multiple things in their head at any one time, and how costly it can be when someone comes along and interrupts that flow. She spoke up to say that when dealing with clients, for example, she too is often juggling multiple things around. I tried to fumble an example of how a developer may be thinking about variable scope, cross-browser API implementation, an outstanding pull request to review and remembering which branch to commit on – all at the same time – but to a non-technical audience this was quite a challenge to explain. It did get me thinking, though. 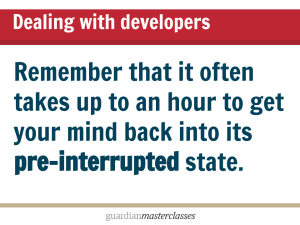 I have other slides in this section dealing with the developer clichés: don’t fill their calendar with meetings; don’t disturb them when they have headphones on; keep communications brief and ideally asynchronous. But why do any of these things apply specifically to developers? This same woman had challenged me earlier in the session when I hinted at some of these points and she suggested developers were “just being precious”. I conceded this, saying that because of their (likely) introvert personas, sometimes humouring them with this was the way to achieve results. This resulted in some challenging questions from another attendee at the end who felt I was telling them to “pander” to developers. Again, I was left wondering why we talk about things in this way. Developers (“makers”) aren’t some special race of superhumans, whose every sensitivity and quirk needs to be preciously catered for. We’re normal people and shouldn’t be made to feel otherwise. Developers love to scoff at project managers and HR people, clogging up important coding hours with pointless meetings and busywork. Again, while there’s some truth to that, it’s also supremely arrogant to label ourselves as somehow above the systems everyone else works with (grudgingly or not). Maybe my slides are just plain wrong and these tips just apply to people in general. 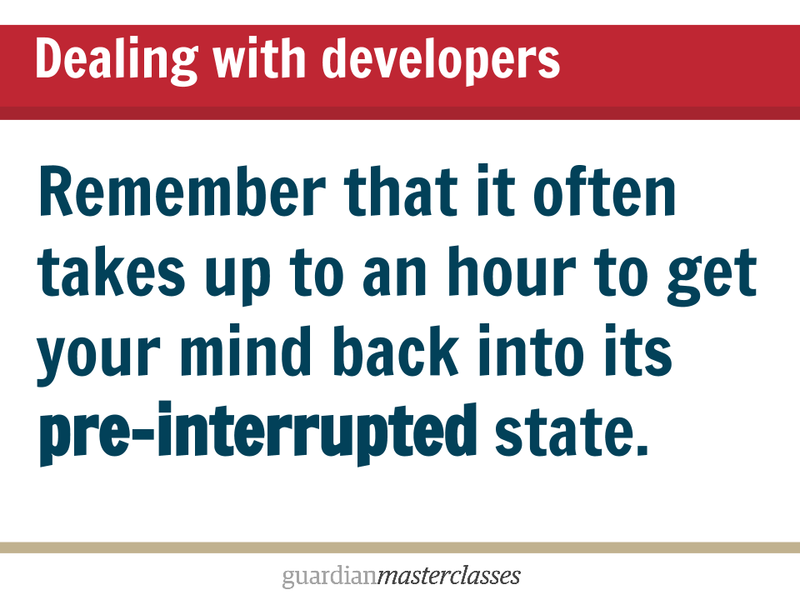 But when researching the talk and reading up on other people’s top tips for productive relationships with developers, these were the kind of points being raised time and time again. Do we really think that as a profession we deserve special treatment? The woman at the end suggested there was some give and take in both directions, which I agreed with, pointing out I was teaching a class to journalists about working with developers, and not vice-versa. Still though: why do you think we treat developers like their needs are special and different from others? How much of this is really true?